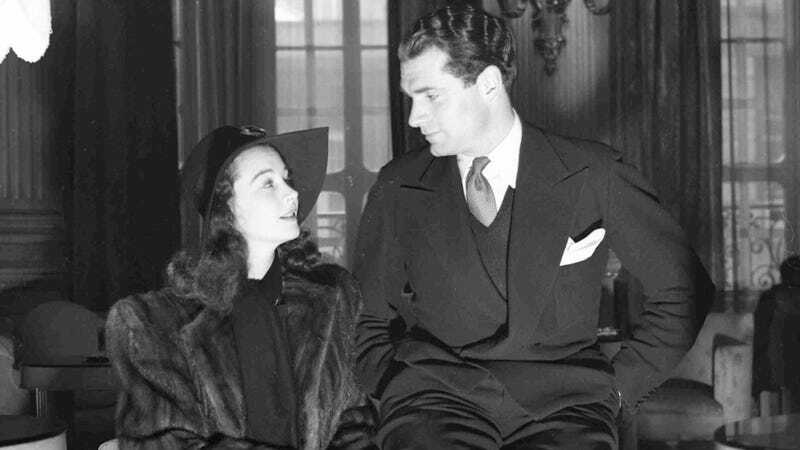 Vivien Leigh and Lawrence Olivier in 1941, shortly after their marriage. Photo via AP Images. The writers of Feud: Bette and Joan are working on a movie about the life of Vivien Leigh, star of A Streetcar Named Desire and Gone With the Wind. Better watch out for Olivia de Havilland this time! That’s according to Variety, which reports that Michael Zam and Jaffe Cohen “will adapt the feature from Hugo Vickers’ ‘Vivien Leigh: A Biography.’ The film will focus on the life of the actress and her relationship with Laurence Olivier, who was her spouse from 1940 to 1960.” A cache of very passionate letters between the two was made public in 2015—“I woke up absolutely raging with desire for you”—but the relationship was a tumultuous one. The collection also reveals Leigh to have been at the centre of intellectual and literary circles in mid-20th-century London and not just as one half of the most glamorous couple in theatre. George Bernard Shaw, Noël Coward and Orson Welles, who decorated a gift of Barbara Jones’s The Unsophisticated Arts with a drawing of a face and a pierced heart, are among those who wrote personal messages in her books. As long as they don’t omit her cats. Jewellery and photographs owned by Vivien Leigh go on display as Sotheby’s announces the sale of her personal collection. Photo via Getty Images.